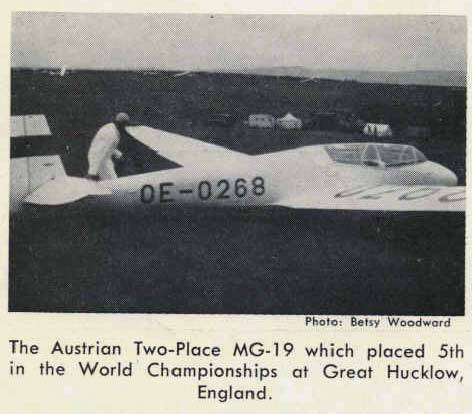 In 1930, Erwin Musger designed his first sailplane, the Mg 2, an 18m span gull-wing machine featuring a cantilever shoulder wing. 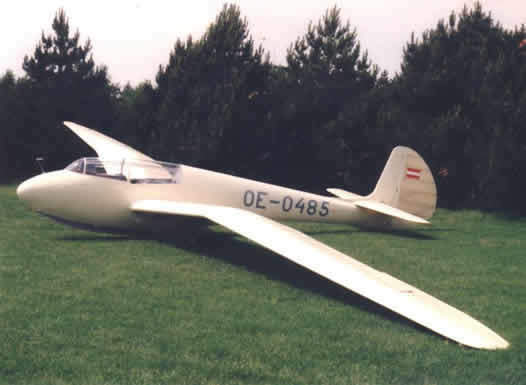 The first high-performance Austrian glider, the Mg 4, followed in 1931, and in 1951, in order to improve sailplane training capability after the reinstatement of flying in Austria, Erwin Musger produced a development of his Mg 9 sailplane designated the Mg 19. This machine also featured a pronounced gull-wing and was intended to serve as a high-performance sailplane as well as a trainer. 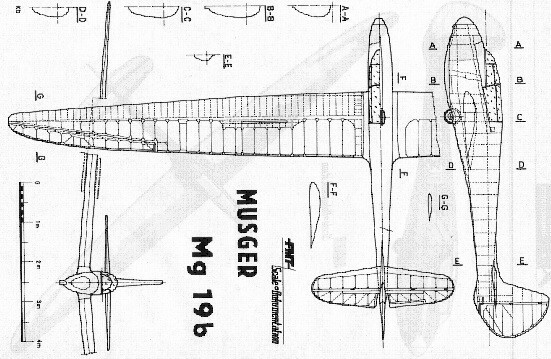 Leopold Hager was responsible for the aerodynamic design and the firm of Joseph Oberlerchner at Spittal an der Drau in the Austrian province of Carinthia subsequently built the Mg 19, known as the Steinadler (Aquila chrysaetos), called in English the Golden Eagle, and its variants Mg 19a, Mg19b and Mg 19c. Construction of the prototype, which had the registration OE-0068, began in June 1951 and was flown for the first time on 25th November 1951 by Toni Kahlbacher and Alois Hasenknopf. 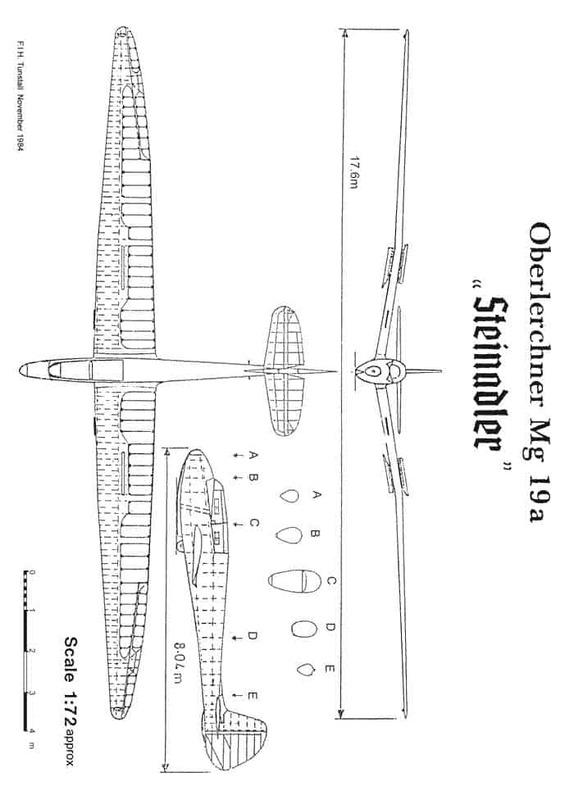 In the course of time, a number of modifications were made to the Mg 19 – Steinadler leading to the three variants Mg 19a, Mg 19b and Mg 19c. During 1956 Erwin Musger set up the Austrian duration record of 8.09 hours and in 1956 a world duration record of 40 hours 51 minutes was also established. Werks Nr. 02-07 Individually built employing casein glue and incorporating several improvements. Werks Nr. 08-11 Identical. construction but employing kaurit glue. Werks Nr. 12 onwards Substantial changes compared with the prototype were incorporated which led to series production of the Mg 19a, Mg 19b and mg 19c. The main change was the elimination of the inboard aileron and an increase towards the wing root of the aileron section. Several construction features were strengthened such as the wing spar mounting, a “D” box leading was introduced and a turbulator strip was added to the inboard leading edge. These features, of course, resulted in a higher all-up flying weight. The only major change was to remove the gull wing with its 10 degrees inboard dihedral angle and flatten the overall wing dihedral to 5 degrees. The Mg 19a and Mg 19b were almost identical in all other respects. The final development in the Mg 19 series resulted from aerodynamic improvements in the fuselage and the wing of the Mg 19b with a change in the wing tip section from Go 676 to NACA 64.015. The Go-549 root section was unchanged. The glide angle was improved to 1:32 from 1:25 as a result of these changes. The external difference between the variants is best appreciated from the 3-View drawings. From published modifications sheets it is known that more than a total of 32 were built, but not how many of each variant. Mg 19a OE-0310 on 26th June 1958 by Ing.Anton Kroener and Arthur Tiefenbrunner. This record stood until 21 August 1958. Mg 19b OE-0393 on 21st August 1958 by Ing. Seigfried Kier and Joseph Dunst. This record stood until 26th September 1965. Mg 19b OE-0393 on 21st August 1958 by Ing. Siegfried Kier and Joseph Dunst. This record stood until 26th September 1965. Mg 19b OE-0345 on 16th May 1960 by Franz Polzer and Walter Lippert. This record stood until 13 June 1963. Flown by an Mg 19b of unlisted registration on 23rd October 1960 by Ernst Schraffl and Dr. Max Schuh. Mg 19b OE-0400 on 26th March 1961 by Herbert Derting and Ernst SchraffL The record stood until 26th June 1964. The fuselage is of conventional construction, i.e. built up formers of oval cross-section, completely covered in plywood. A two-piece plexiglass canopy of wood and steel tube construction covers the tandem seating arrangement. Better visibility for pupil or passenger is provided with the rear seat (on the C of G) about 13cm higher than the front seat for the pilot. The low-set wing root has the trailing edge almost level with the bottom line of the fuselage. A single, fixed wheel is half enclosed in the fuselage. A rubber-cushioned skid is fitted ahead of the wheel. The cantilever-tapered wings with elliptical trailing edge outboard panels feature a pronounced gull form with 10 degrees inboard panel dihedral and 2 degrees dihedral on the outboard panel. Forward of the single spar is plywood covered “D” box leading edge with fabric covering for the rest of the wing, including the aileron. Schemp-Hirth air brakes are unusual in that the lower brake housing is extended beyond the dihedral change. The cantilever tailplane is of normal construction with a sheeted leading edge and fabric covering. A trim-tab is positioned on the starboard trailing edge. The fin is skinned with plywood and the rudder is covered with fabric. 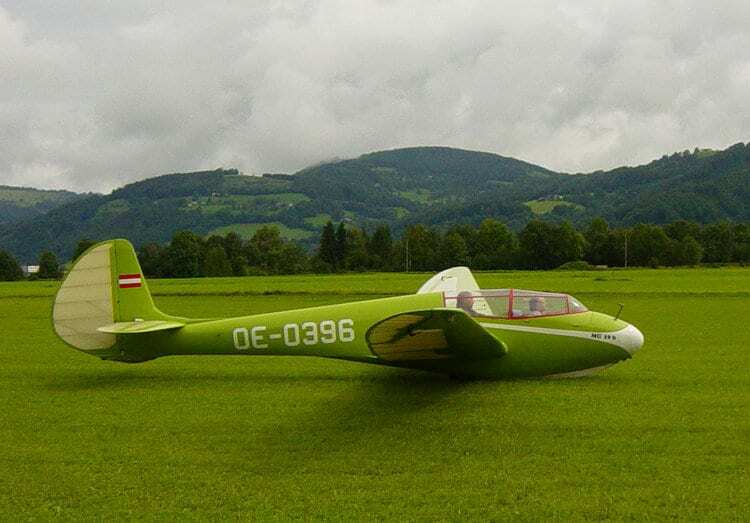 In 1981 the Alpine-Sportflieger- Club, Leoben-Donawitz, in the Austrian province of Styria most generously donated their former Mg 19a Steinadler club trainer OE-0324 to the Vintage Glider Club of Great Britain. 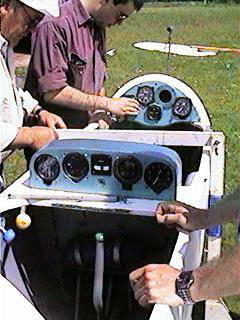 In October 1982 the glider was trailed on an open trailer from Austria by Chris Wills and Tony Maufe with assistance from Rainer Karch. The Austrian C of A expired in May 1977 and despite storage for five years it was in very good condition. Following C of A work by Eric Rolf at Moreton in the Marsh the Steinadler, now registered as BGA 2903, had its first two flights in England on 5th June 1983 at the Avon Soaring Centre. In spite of poor conditions, the flights went off successfully in the hands of Tony Smallwood and Chris Wills. An all-metal enclosed trailer was built, which allowed the Steinadler to be taken to the VGC rally in June 1984 at the London Gliding Club, where it was flown for the first time on the 15th by Chris Wills and Ian Tunstall, followed by David Jones and Chris Wills. 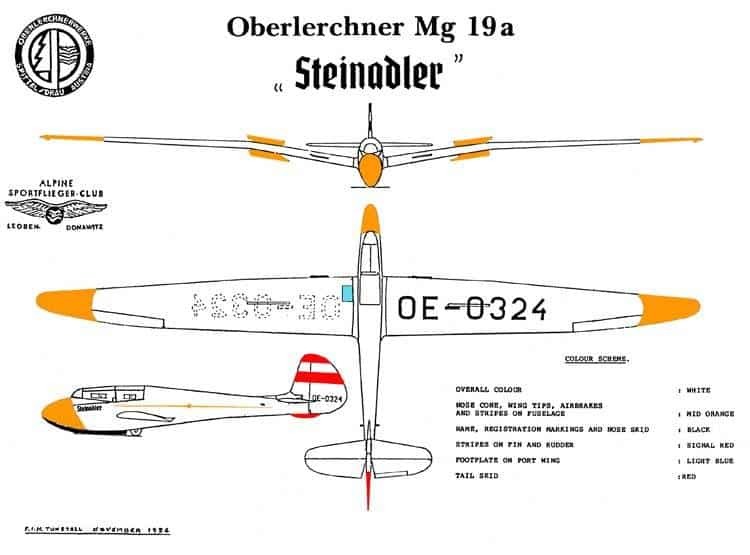 Each flight of one and a half-hour’s duration was in good thermal conditions during which the Steinadler was shown to be a superb example of a high performance two-seater. 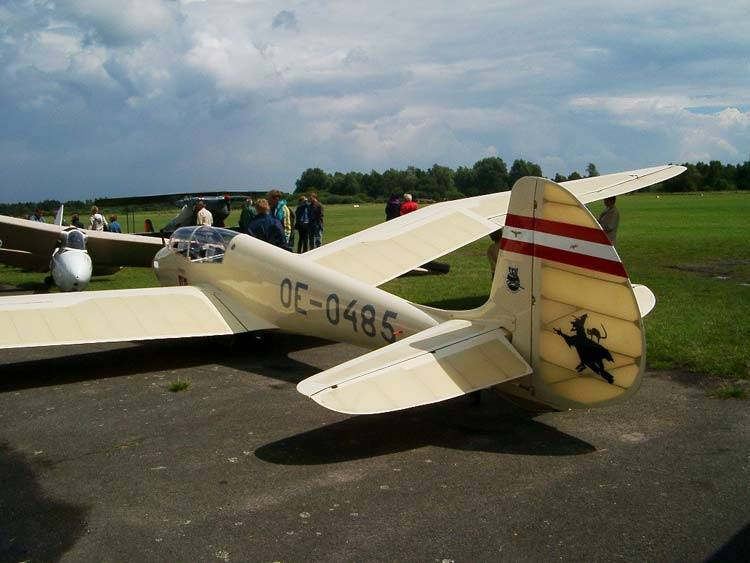 VGC members in the Steinadler during the rally made a total of five flights. Acknowledgement – The author gratefully acknowledges the invaluable contribution of data for this technical article made by Heinz Ottrin, a member of the Austrian Alpine Sportflieger Club, Leoben-Donawitz. The Mg 19 was many of the many attempts by different designers at the time to improve on the German Kranich 2 which had been in widespread use for record flying and for training since 1935. Although the Kranich was much loved and had been used by instructors and competition pilots for thousands of hours and flights, its only major shortcoming was very little view for its rear-seat pilot who was surrounded by wing, the upper wing surface of which was just below his head. Therefore, every postwar two-seater attempted to solve this problem in different ways. Whereas the Kranich’s rear-seat pilot sat behind the main wing spar on the Centre of Gravity, Erwin Musger sat both pilots amid the wing’s torsion box leading edges. To further improve the rear pilot’s visibility the wing was mounted on the fuselage in “low” configuration. Thus, while not completely solving the forward visibility problem, the Mg 19 can be flown from the rear seat more easily and safely than the Kranich could. Erwin Musger, by clever design, was able to place the two pilots closer together than those in the Kranich 2, making communication and the passing of objects from the rear to the front seat more easy than in the Kranich. As both pilots are ahead of the main wing spar, the rear fuselage has to be slightly longer than the Kranich in order to maintain the correct C of G.
Another hoped for improvement over the Kranich was the use of the Gö 549 wing profile. This is the profile that was used on the Reiher, Weihe and Meise before the war and was, in 1951, being used for one of the first post-war German two-seater designs, the Kranich 3. It was thought at the time that by clever aerodynamic design, with minimum geometric washout at tips, coupled with higher wing loadings, this profile was capable of rendering a still greater performance as regards max L/D and speed, than it had achieved when used on prewar sailplanes. 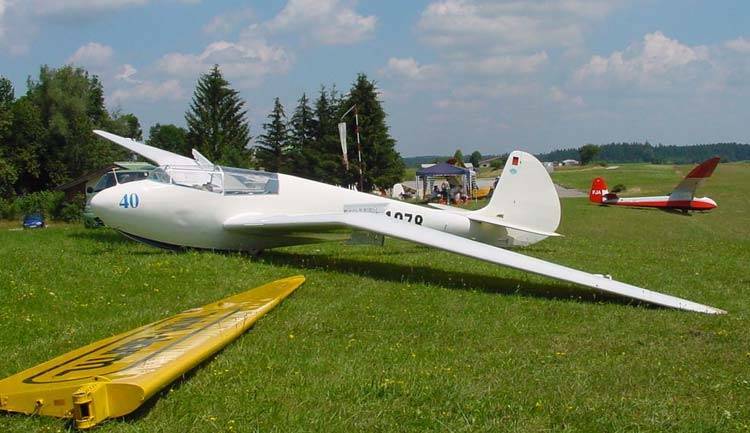 The Kranich 2 had used the excellent Gö 535 wing profile to its maximum advantage. This was the wing profile of the Grunau Baby and was slow until loaded up. It was felt that, although the Goettingen 549 might not have the absolutely safe low speed characteristics of the Goettingen 535, it was still an excellent profile, which would offer less drag at higher speeds than the 535. Another field in which it was hoped to improve on the Kranich 2 was the rigging. In the Kranich 2, every single one of the 13 safety pins is locked as well as being secured with nuts. The Mg 19, inspite of having two more main wing pins than the Kranich 2, has all its pins automatically locked with spring loaded pins. This is an unbelievable luxury, which is not found on many other gliders of the time. The only safety pins secure the two transverse tailplane pins, which have no bolts, but are otherwise exactly the same as those on the Kranich 2. Another improvement over the Kranich 2 is a large built-in landing wheel to take shock of landings, to assist take-offs, and to facilitate ground handling. Apart from its gulled wings the Mg 19a is relatively modern in concept. 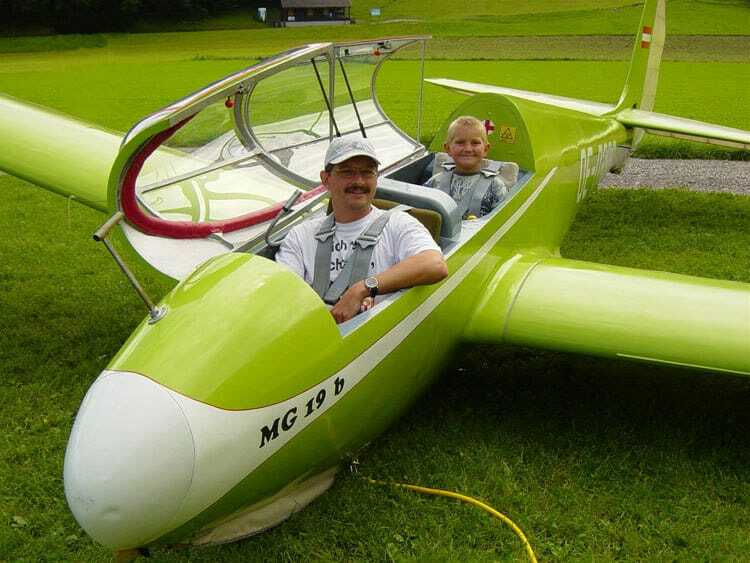 Thus, we have a two-seater sailplane comparable with other two-seaters, in use today. We feel that, whereas perhaps its handling is not improved over that of the Kranich 2, it is improved in every other way. During the 1950’s in Germany, it became usual to shorten spans of ailerons hoping that they would become lighter to use, and thus, more efficient, than long span ailerons. (This was done to Weihes and Ted Hull’s Rhonbussard at the time). In our opinion they did not become more efficient, especially at low speed. Whereas the MG 19a’s might be considered adequate, its original long-span ailerons may well have been more efficient.